Sierra Buildings is pleased to offer customers an impressive line of quality insulated panels through our sister company Metl-Span. All Metl-Span products have a reputation for delivering superior strength, longevity, and aesthetics. Metl-Span panels offer a combination of superior performance and attractiveness. 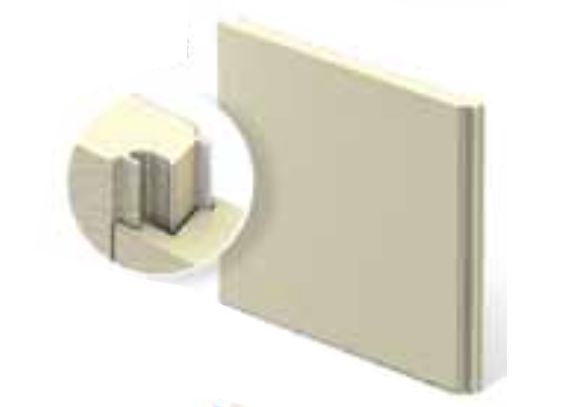 Concealed fasteners support a unique interlocking panel system that assists in eliminating thermal short circuits and breaks – all while providing superior resistance to air and moisture. In addition to the benefits of having continuous insulation, Metl-Span panels also have excellent r-values that result in superior thermal efficiency. The standard panel features a smooth exterior skin that can also be ordered embossed. Ideal for roof and wall applications, the interior skin is roll-formed with our standard interior mesa profile. This panel offers 1 1/4" high major ribs at 12" on center and is attached to the structure with a through-fastened system. LS-36 achieves r-values up to 44.84. This panel offers an exterior profile that has 2" high standing seam with an embossed Mesa profile that also serves as the interior profile (smooth exterior and interior skin is also available). The exterior profile roof slopes can be as low as 1/2:12. This panel is designed exclusively for roof applications and utilizeda concealed clip attachment. The CFr panel achieves r-values up to 46.08. This panel affords a flat appearance providing a monolithic look that is ideal for high profile, vertical architectural applications. Both the interior and exterior skins are stucco embossed, including a light Mesa profile on the interior skin (smooth exterior and interior skin is also available). This panel is designed for wall applications. The Architectural flat panel achieves r-values up to 32.57. This panel offers a Mesa profile for both the exterior and interior skins. This panel is designed for interior partition, interior ceilings and exterior wall applications. The Mesa panel offers r-values up to 47.62.
of the panel is a Mesa profile. 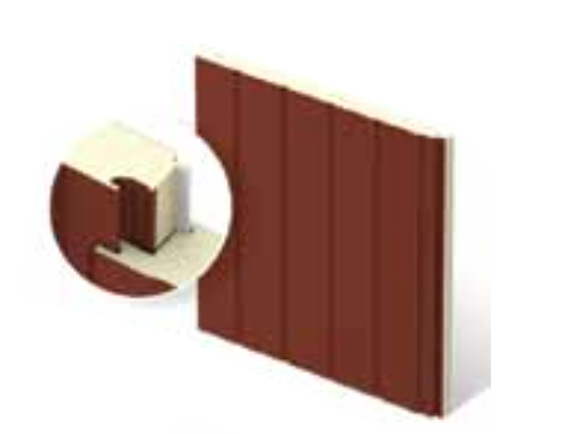 The Flute wall panel achieves r-values up to 47.62. The wall panel offers a heavy stucco embossed pattern resembling old-world hand plaster for its exterior skin. The interior skin has a Mesa profile and offers r-values up to 32.57. The wall panel employs minor striations in the exterior skin, which provide a linear appearance while blending with the panel side joints. The interior skin is a light Mesa profile. The striated panel achieves r-values up to 30.86. The Insul-rib insulated metal wall panel combines a traditional 7.2 rib panel design with a polyurethane foam core. This widely used profile is now available with exceptional insulating properties in various thicknesses. 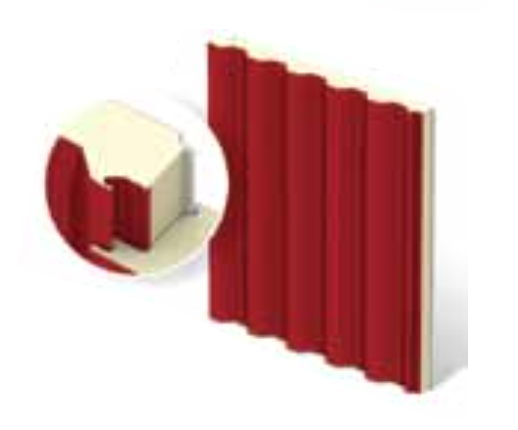 The 7.2 Insul-rib panel achieves r-values up to 31.85. The ThermalSafe panel combines an advanced design with sophisticated manufacturing expertise to create a non-toxic composite panel. Its core is made from non-combustible structural mineral wool boards that are processed in the factory to maximize compressive strength. The ThermalSafe panel achieves r-values up to 29.73. This metal wall panel is an air, water, thermal and vapor barrier panel that can be used behind any type of façade. There are no thermal bridges which help to increase the energy efficiency of the wall. HPCI Barrier is quick and easy to install and provides an economical solution to conventional barrier panels without sacrificing thermal efficiency. The HPCI Barrier panel achieves r-vale up to 44.64.